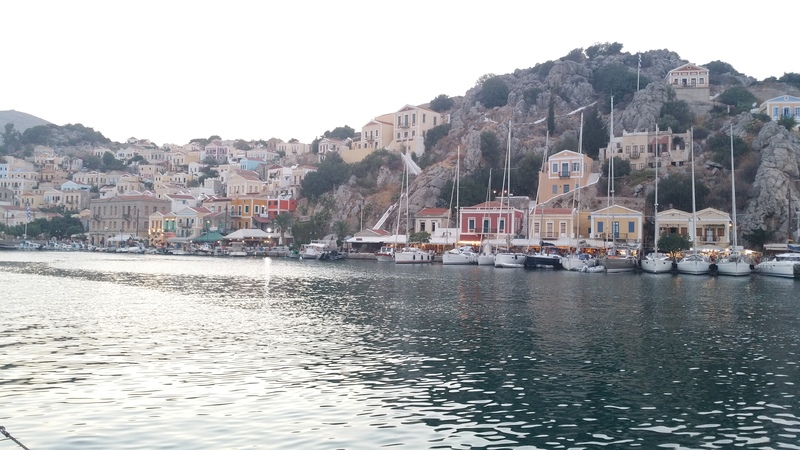 Our first morning back in Greece, just planning a wander along to pick up a Cheese Pie and the Port Police tell us, very politely, we had to move by 11 as we were on a ferry berth. Simi is a pretty place and we were in two minds as to whether to move to another gap when someone left, or to simply leave all together. The berths in Simi are exposed to the wash from the numerous ferries, and the previous evening had been so unexpectedly good that we didn’t want to spoil the memory with a mediocre second one. With just enough time for a the Cheese Pie, we left and headed for Pedi, a large bay a few miles south of Simi. We’d heard nice things about Pedi, which is pretty and thought we’d stay overnight before moving on. But, it is notorious for poor holding, with yachts invariably dragging their anchors; even the author of our Pilot Book dragged his anchor there so what hope did we have?! 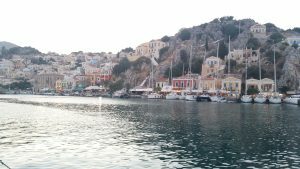 So, we anchored and made sure it was well dug in then settled down for a BBQ and a nice cool swim, planning to go ashore for a walk in the evening, grab a wine and a welcome-back saganaki. As the afternoon wore on the wind began to build and got to about 20 knots when we started to drag. It is quite alarming really, suddenly finding all the other boats around you drifting slowly by ……. . We heaved up our anchor and had two other attempts to get it to hold, both unsuccessful, before I decided to head out for another anchorage before everyone else got the same idea. There are 4 other bays on the east coast of Simi where you can anchor. The first is described as being deep, the Pilot Book advising ‘anchor where depths are convenient’, code for ‘good luck with that’, the second is ‘a good lunch stop’ or ‘you wouldn’t want to be here for too long in a blow’. 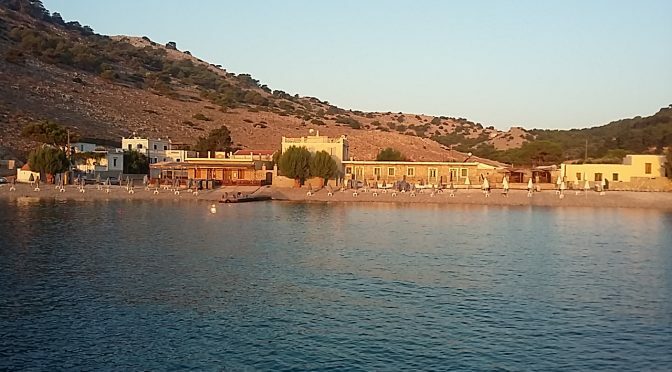 I set off for the third bay called Ormos Marathouda; ‘anchor in 4-8 metres at the head of the bay’. Many of these islands are subject to Katabatic Winds on their lee sides. The wind climbs one side of the island and then falls off the other, rolling down into the bays at higher than expected speeds. As we passed each of the bays the wind was gusting to over 20 knots, dropping away again before the next inlet, and Marathouda was no different, it was however, almost empty. Either a really good sign or a really bad one. The only other yacht there was tied to a 20 litre plastic can on a piece of string. These are ‘laid moorings’ which are generally concrete blocks with a chain and rope attached. There was a second one not too far away from it but I am always loathe to pick up such moorings as you do not know what is actually on the other end; with my luck it would a lobster pot, the 20 litre drums have multiple uses!! We anchored in the dead centre of the bay and let out plenty of chain. It felt well and truly set in a depth of 7 metres and as the water was crystal clear I snorkelled out to check the anchor was well dug in before settling down for the evening. 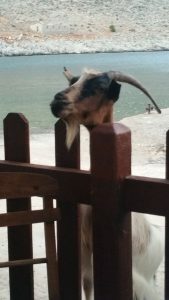 There is a small hamlet at the head of the bay with a very local taverna on the beach; we took the tender ashore in the evening for a light snack and whiled away the time watching the local goats, watching us, watching them. 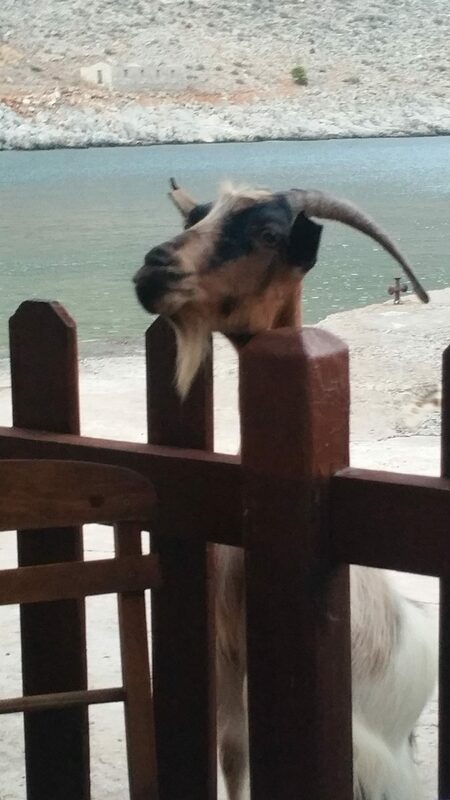 The picket fence made sense now; cats in a taverna are bad enough, but a herd of goats !!!?? We also tried to connect to their WiFi, but it was hopeless. This is my ‘blogging challenge’, getting strong enough WiFi signal or enough data to publish photos and blogs! We almost completely failed to connect! 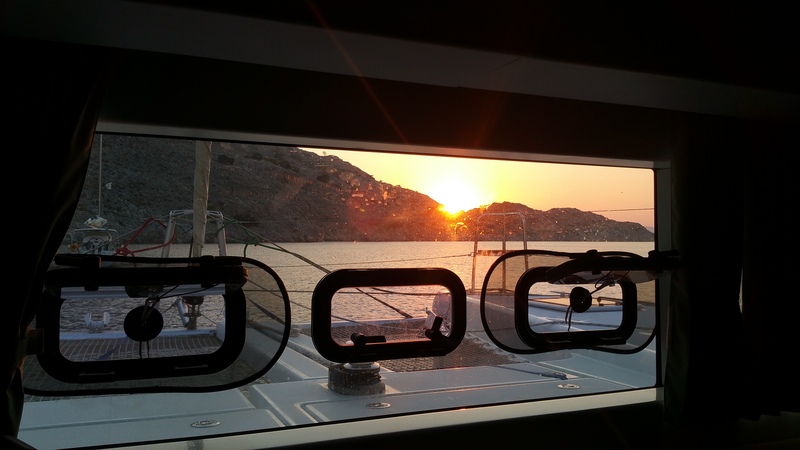 It was so nice, and the winds forecast to be so strong on the west side of the island we stayed at anchor for the whole of Wednesday waiting for our opportunity to push on towards Tilos. Marathouda was one of those last minute, spur of the moment destinations which turned out to be lovely. It was fairly quiet, relatively sheltered with good holding and beautiful clear waters. Clear other than first thing in the morning when a slick of unmentionables tends to wash in on the morning sea breeze. If the wind is in the other direction it goes to Turkey, but on Wednesday it was Greece’s turn! We found this out chatting with a local fisherman, ex Merchant Navy engineer who had worked in the Brooklyn Shipyards in the 1970s and whose family owned 11 of the houses around the bay. We only counted a dozen buildings, not including the taverna and the church so figured he must also be the Mayor! The slick dissipated, as the Mayor had predicted and the waters returned to being crystal clear so we spent our time swimming and snorkelling and then planning our next legs west, dodging the Meltemi. We have a cunning plan to dodge the adverse winds which will be put into operation tomorrow morning at 4 am!